Men's 'Alain' slippers from Dunlop. 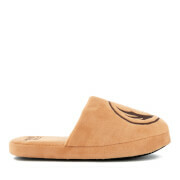 With a leather-inspired construction, the slippers comprise a rounded toe, elasticated side gores and a branded tag. Set on a durable sole with a patterned tread for added grip. Upper: Textile. Sole: Other Materials.